Girls are invited to develop an app, website, computer program, 3D printer template, or anything else “tech” that they’re inspired to create – as long as it has a philanthropic purpose. Each submission must either directly benefit, or provide a service on behalf of a nonprofit organization, church, school, or government agency. In a nutshell, use your tech skills to make something that helps others. Identify a need in your community (something you’ve noticed, or talk to an adult you look up to for help brainstorming). Identify the beneficiary you want to work with (nonprofit, church, school, or government agency) and talk to someone there about what your idea is and how it could be of service to the community. Your project doesn’t have to be completely brand-new, but it does need to be designed to be helpful to the group you’ve identified. Get started on the tech. How and what do I submit? Along with your tech entry, make sure you tell us about what inspired you, who you are helping and what skills you used to make it. An endorsement from the organization you are helping would be awesome. Technical skill, creativity, and ingenuity. Likelihood of implementation to fulfill purpose. Inclusion of inspiration, creation process, skills utilized. Clearly identified intended audience(s) to use/benefit from project. Clarity of instructions and ease of use for intended audience. Demonstration of outreach to intended beneficiary (provide endorsements such as personal reference and/or letter of recommendation). Technology is an amazing thing in that sometimes the younger we are when we begin to learn, the faster we excel at it. For that reason, submissions will be weighted by criteria stated above instead of the age of the creator. The Grand Prizes in the past have included a laptop to the winning team! The winning project and each of the runners up will receive tech-focused prizes, sponsored by AT&T. Prizes are determined by number of girls per team. All of the finalists will get to go to the Capitol on April 11th to meet with the Governor and legislators. Q: Who is eligible for the contest? A: Arkansas girls in grades 6-12 who are passionate about honing their technology skills are eligible to submit a project. Limit, one submission per project, 1-4 girls may work on a project. Q: Is the contest only open to girls who participated in the #ARKidsCanCode: Girls of Promise Coding Summit? A: No, they don’t. There are TONS of girls across our state who are totally into tech but, whether because we just didn’t have enough room for everyone, they didn’t learn of it in time, or the schedules didn’t work out, weren’t able to attend the summit. Q: Does my submission have to be fully implemented? A: While submissions are weighted by level of completion, we will accept demos. Q: If I'm selected as a finalist, how do I get a shot at winning? 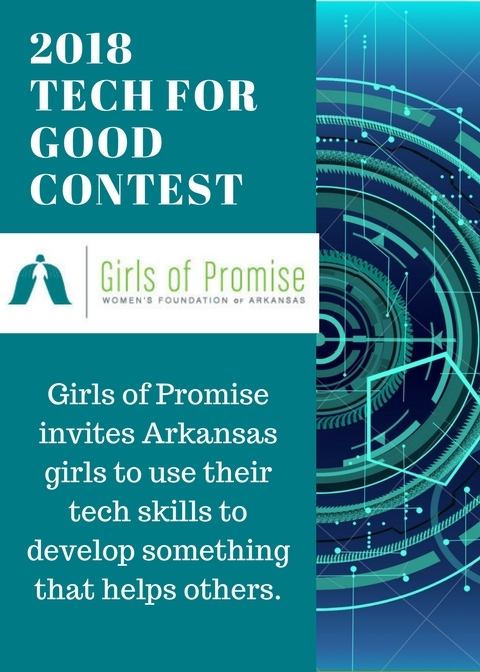 A: Each finalist will present her tech submission at the 2019 Girls of Promise® conference on the evening of April 11. Q: Will it cost anything for finalists to present at the 2019 Girls of Promise® conference? A: All meals, lodging, and transportation between Girls of Promise® activities will be provided by the Women’s Foundation of Arkansas. Finalists are responsible for their own transportation to the conference in Little Rock.